Thyme gives this dish depth while the cream cheese makes it irresistible. A lighter take on the classic risotto yet still just as flavorful and comforting. To me, I think of risotto as the Italian version of mac&cheese, only way better. It's comforting, creamy, full of flavor and super easy to prepare. 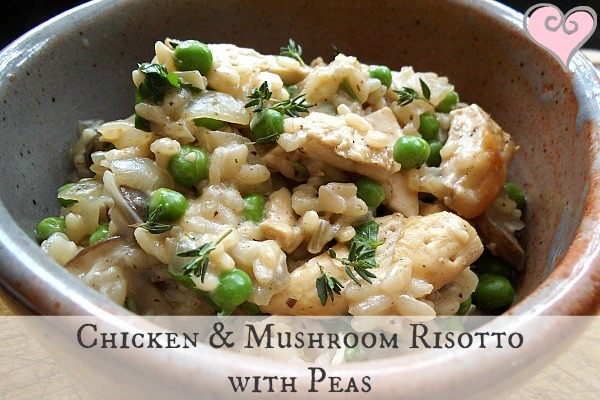 This was my first batch I'd ever made of risotto and it turned out wonderful! The key is to be patient and wait for each ladle of broth to be absorbed before the next ladle of broth goes in. 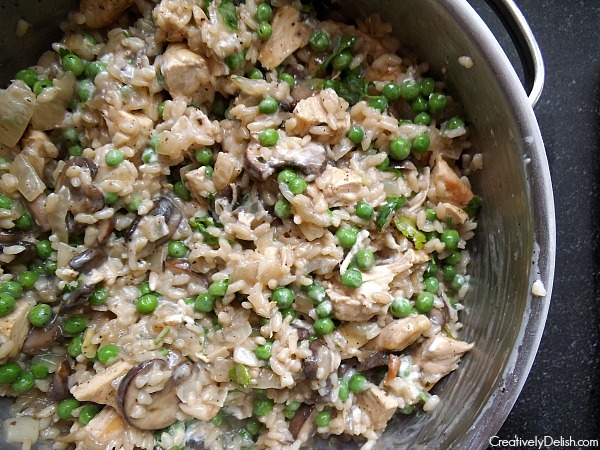 My version was made with light cream cheese to finish it off for an extra boost of creamy flavor along with spring peas, mushrooms and fresh herbs to keep it nutritious. I added in the chicken to make it a complete meal, however this can easily be made vegetarian by using vegetable broth and omitting the chicken. I've seen risotto done in numerous ways. 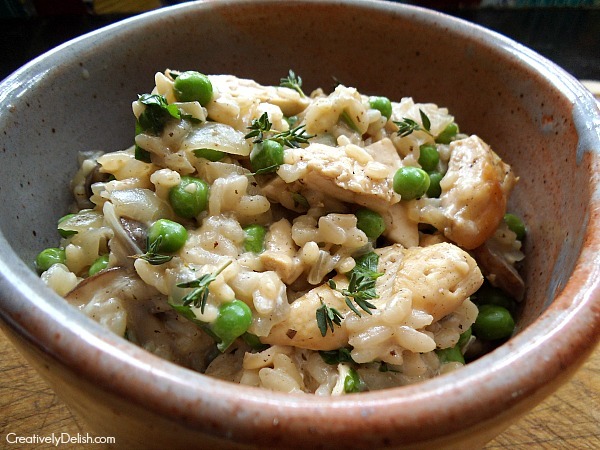 Risotto is made with arborio rice which is a traditional Italian rice that's thick so it sops up all the broth. You can mix in whatever you prefer, although for spring nothing beats fresh peas and herbs. After about 30 minutes of cooking, the dish is finally ready to devour. If you have leftovers, reheat them slowly on the stovetop with some broth. You can also top fresh parmesan cheese over the finished product for some extra nutty flavor, or add in toasted pine nuts for some flavor and crunch. I like to think of this as the Italian Mac&Cheese, yet so much more refined. You get the comfort factor from the creaminess with fresh herbs to keep it "light". At just around 400 calories, this is a winner. Preheat the oven to 450 and line a baking sheet with tin foil. 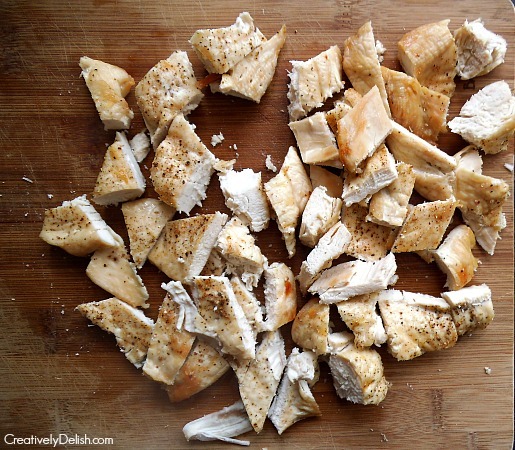 Place the chicken fillets on the sheet and bake for 20-25 minutes, or until cooked through, then chop. While the chicken bakes, in a small saucepan, combine chicken stock and water and bring to a boil, then lower to a slight simmer. In a deep saute pan, heat olive oil over medium-high heat and cook onions for 4 minutes or until softened. Add the garlic, thyme, and mushrooms and cook for another 2 minutes, stirring constantly. Add the white wine and stir to scrape up any browned bits from the bottom of the pan (1 minute) then add rice. Stir and let it cook for about 2 minutes then add ½ cup stock mix and keep stirring until the rice absorbs the liquid. At this point the chicken should be done and chopped, or almost done, so be sure to add the chicken in to the rice mixture as soon as you can. Continue ladling ½ cups of stock, waiting each time for the liquid to be absorbed before adding another ladle, until you are out of stock. This should take about 20 minutes and you will need to stir it constantly. Once finished, remove from heat and stir in fresh parsley, cream cheese, peas and some salt and pepper. 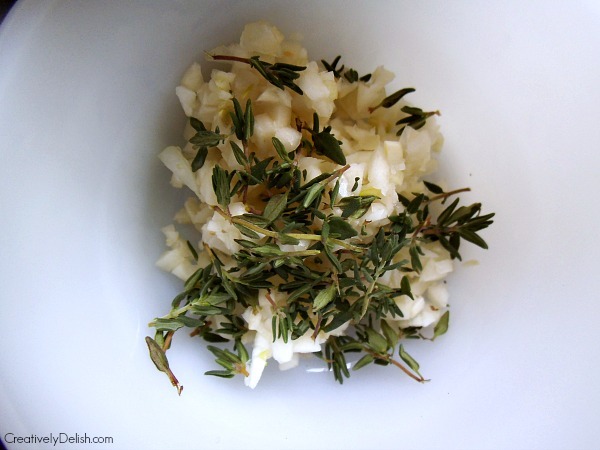 Combine until the consistency is creamy then serve with fresh thyme leaves to garnish.